Fresh off 11 straight consecutive victories in '83 season and a win at the Holiday Bowl. 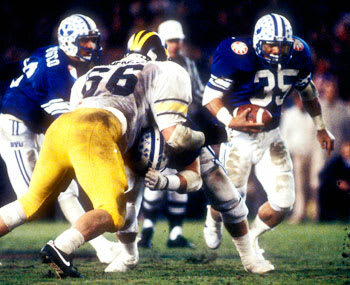 The Cougars came back to continue the streak throughout the '84 season by winning 13 including another Holiday Bowl against Michigan. Through hard work (and maybe a little divine intervention—the major conference teams all picked each other off throughout the season), BYU was the only undefeated team standing and declared the national champion, becoming the last team outside of today's BCS to date to win a I-A or FBS national title. Plus, they all got to celebrate by doing missionary work in places with rampant disease. What's more badass than that?